Balloon Flight over the Masai Mara, Kenya. 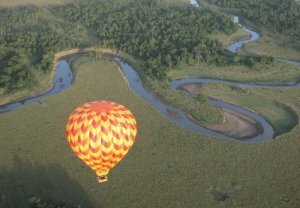 The balloon flight takes you over the diverse habitats of the Masai Mara Reserve; the great Mara River, swamps, forests, wildlife and the African Savannah. The scenery from a hot air balloon is unforgettable due to its spectacular and breathtaking nature; the ultimate safari experience. The diversity of our flight trail enables our Clients to experience a unique opportunity to be a part of the Masai Mara from the air. The gentle and silent nature of the balloon flight allows the passengers to view the wildlife from a comfortable distance. The big five; the lion, leopard, elephant, rhino and buffalo can be seen frequently along with other animals such as hippos, crocodiles, giraffes, zebras, antelopes, birds and many more. Maasai Mara; Often referred to as the 7th wonder of the world, the Masai Mara is a place that has to be visited. Viewing it from above ground level is an experience of a lifetime that will truly be with you forever. It is a rare and precious adventure never to be forgotten. The hot air balloons are launched at a site not far from the Great Mara River or Talek River. The balloon flight is launched between 6:00 and 6:30am (sunrise). The balloon travels 15 to 25 kilometers depending on wind conditions.We launch the balloons from a camp at sun rise. Large electric fans cold-inflate the balloon; the electric fans are operating silently so that the guests can hear animals in the serene atmosphere of the Mara. When the balloon is inflated the pilot lights the gas burners and heats the balloon. The heat launches the balloon in to the air. As soon as the balloon is launched, the Clients step inside the basket and the pilot takes off.The average flight duration is 1hr; traveling approximately 15 to 25 Km depending the wind condition. On 95% of the days, the wind takes us south deep into the Masai Mara Reserve where we land. Upon landing, a champagne breakfast is served in the open plains of the Masai Mara. Once breakfast is over the passengers are taken back to their lodges and camps en route a game drive. Our pilots are highly experienced balloon operators and have accumulated numerous hours in the profession. They have also spent a lot of time in the Masai Mara and this has provided them with excellent knowledge of the Masai Mara and made them good tour guides. Maasai Mara By Road Safari. Backpacking in the Mara at its Best.